Traditional local food, plentiful wine and even more dancing. 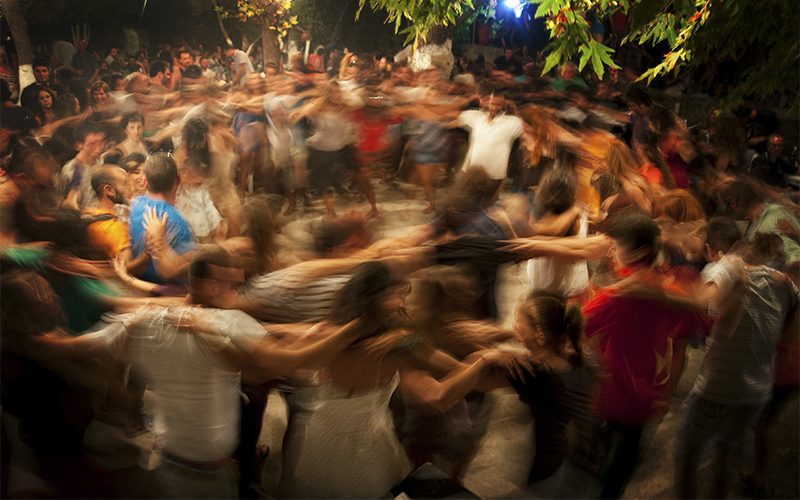 Forget plate smashing for tourists - head to a local panigyri to party like a true Greek. 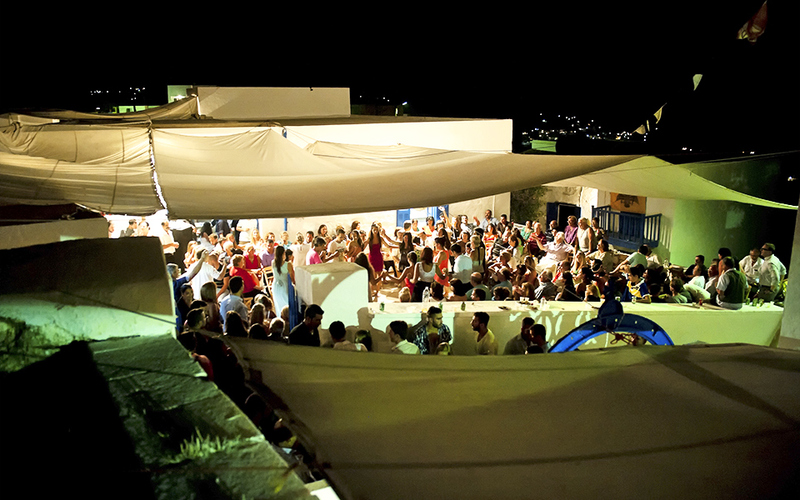 Throughout the summer on the Greek islands every night is a chance to party. Even on the sleepiest of islands there will be a selection of bars and clubs offering thumping music, drinks and dancing until the wee (and often not-so-wee) morning hours. But none of these quite compare to another type of island party: the panigyri (plural: panigyria). These are traditional church-centered celebrations held by communities to celebrate the feast days of local patron saints. The precise roots of the Greek panigyri are lost in the mists of time but certainly extend back to ancient time. If the words ‘traditional’ and ‘church-centered celebration’ put you in mind of rather staid and dull affairs, think again. Fueled by plentiful wine and food (often offered for free) Greek panigyria feature plenty of live music, heady dancing and enthusiasm that lasts long into the night, with the local community rubbing shoulders with tourists and anyone else who shows up (all are welcome). And the fact that they are attended by all ages from toddlers to their great grandparents only increases the positive vibes. Panigyria are held throughout the year but the biggest and most spectacular are held at the summer’s peak on August 15 to celebrate the assumption of the Virgin Mary (Panaghia in Greek) – a date that is one of the most important of the year for the Greek Orthodox Church and for the thousands of churches throughout the country dedicated to the “Panaghia”. So if you are in Greece in August it is well worth seeking out a traditional panigyri to enjoy delicious local food and wine and to experience truly authentic Greek dancing arm in arm with the locals in an ever expanding circle (don’t worry, they’ll teach you the basic steps). It will likely be one of the high points of your holiday. 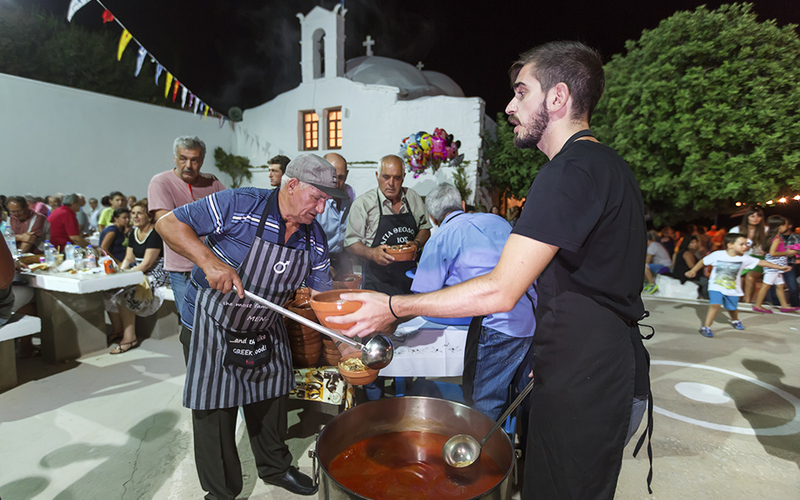 The biggest panigyri of the year on Amorgos takes place in Aigiali near the church of Panaghia Eptachoriani and lasts for two days. On the first day on August 14 an evening mass is held in the church after which nistisima dishes (i.e. without meat or dairy products) are offered such as chickpeas and the wheat-based kofto. On August 15, following a church service, tables set up for the event are served with patatato (a local specialty made with meat and potatoes cooked over hot coals) and patsa (a soup made with beef or lamb stomach). After the food the party really starts to get going in the village square where local musicians play and the whole community dances until the morning. 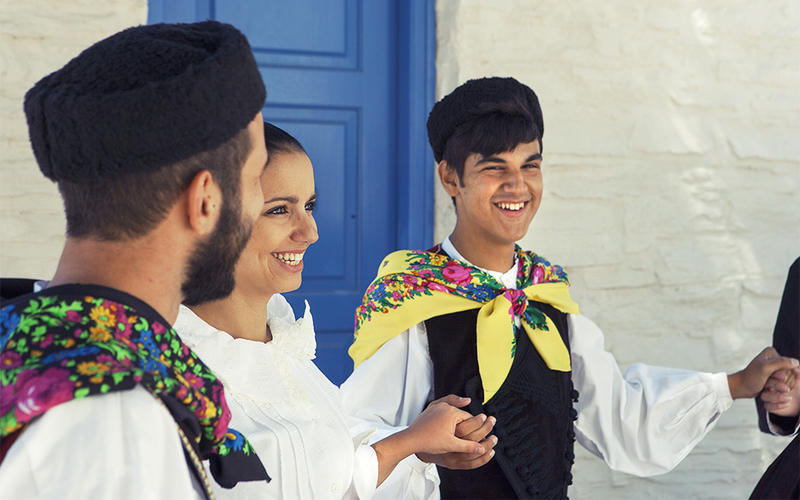 People who come from Kea and those who have fallen in love with it alike travel to the island in August specifically to dance the traditional “Syrtos”. 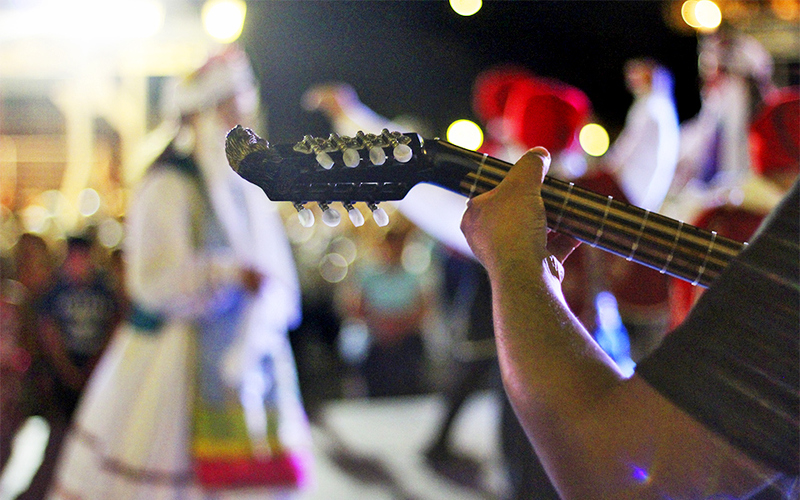 Kea’s panigyri begins in the evening on August 15 in the square of Ioulida, the island’s capital. Traditional delicacies are offered such as loza (a type of sausage), paspalas (pork cooked with tomatoes and egg) and local cheeses. To wash them down local Mavroudi wine flows freely. A band playing traditional instruments sets up on the steps of the neoclassical building of the old town hall and high spirits brought on by the wine and music will be certain to keep you on your feet for the entire night. On the day of the panigyri in Pounda square locals work hard to ensure all of the island’s visitors will have an unforgettable experience. Following the evening mass, visitors and locals head to the square where local mezes are on offer such as meatballs and traditional cheese pies. A band playing traditional instruments such as the lute, fiddle and tsambouna (a type of bagpipe) starts playing and induces many a tourist (who greatly outnumber the locals) to attempt some of the local dances. The festivities last from the evening until the next morning and for as long as the crowd’s stamina lasts. On August 21 visitors to the island can also try kaikokakavia, a delicious fish soup made from small fishes cooked by fisherman right in their boats. In Emporio, a mountain village built on Nisyros’ northern ridge, the main panigyri is held in a amphitheater-like space where one can clearly see and hear the band regardless of where one is sitting. Locals and visitors sit together at large tables and strangers rapidly become friends, eating, drinking and dancing together. The dishes such as meat in tomato sauce with potatoes is cooked and given out for free by volunteers from the village. It is not by chance that Ikaria’s panigyria are arguably the country’s most famous as the island takes them very seriously. Imagine something like an all-night rave party only with traditional music and over 1,000 people – tourists, locals, the old and young – all dancing in a giant circle. It is an experience that you will carry with you long after the band plays its final note (usually well after daybreak). 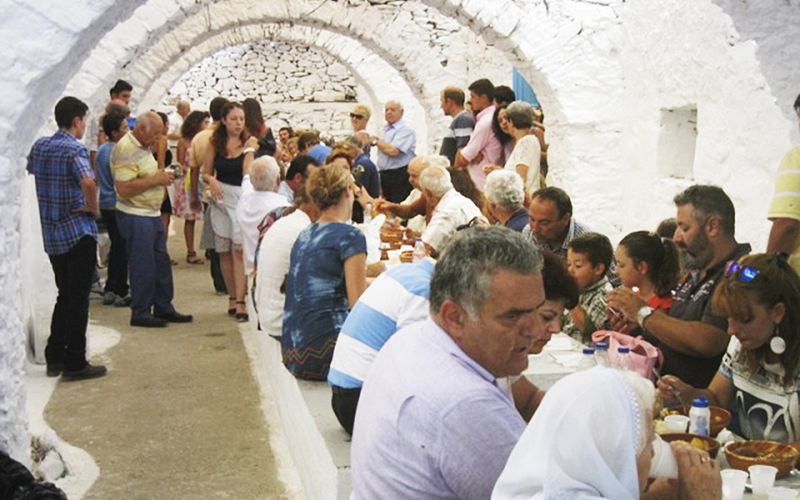 One of the island’s biggest panyiria is held on August 15 in the village of Lagada. You will eat grilled or stewed goat, drink plenty of raki and learn what it means to dance the famous ikariotiko. On August 15, every year panigyria are held on Serifos in the village of Ramos near the area of Livadi, and in Skopous. Many tourists join in on the festivities to sample traditional dishes such as tourlou (a mixed vegetable dish) and fava (split pea) as well as local wine to the sounds of the lute and fiddle. The dance circle starts off small and then grows and grows as the night wears on until everyone is as one happy family. 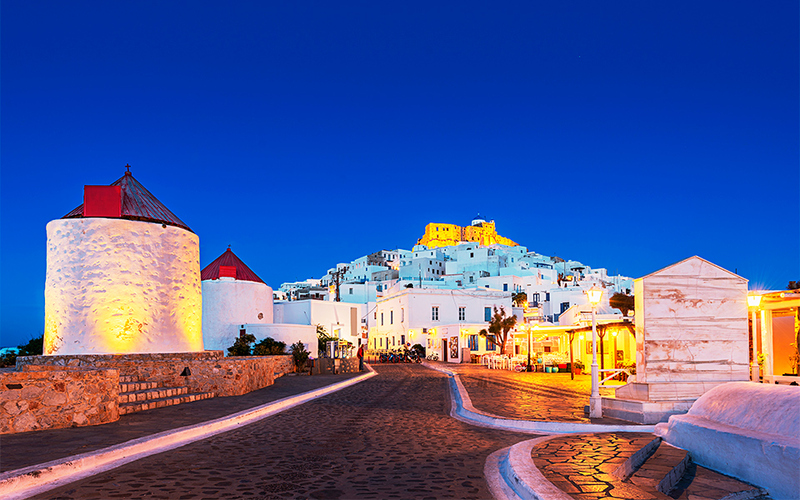 You will drink, eat and dance until you drop to music played by local musicians underneath the impressively-lit castle of Astypalaia which dates to the 14th century. For two days over August 14-15 the island holds a panigyri in the main town dedicated to the church of Panaghia Portaitissa. On August 14, from 20.00 until late at night mezes are offered, cooked by locals. On the 15th a seat awaits you at the “Table of Love”. More food and drinks are offered for free out of a sense of gratitude towards the tourists who have selected Astypalaia for their holiday destination.